Origin: Mexico. 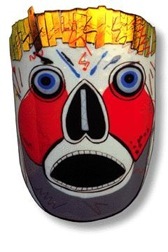 This is a ceremonial Mask used in the Day of the Dead. Size 14x20 on 8x8 Plexiglas stand. Done in various shades.